being MVP: Ozeri: Fresko Duo Salt & Pepper Grinder & Giveaway! Ozeri: Fresko Duo Salt & Pepper Grinder & Giveaway! Salt and Pepper are basics in cooking and a good mill is hard to come by. I think we have gone through a handful of shaker/mill combinations in 6 years! I was excited to try the Ozeri Fresco Duo Salt & Pepper Grinder. It was smaller than I anticipated (for being a duo) but nice nonetheless. It is made of quality stainless steel and acrylic in Germany. To fill, just pull apart in the middle and put pepper on one end and salt on the other. This is so simple that probably Kenzie could do it. The chambers are small so you don't need much. The ceramic grinder allows an effortless adjust from coarse to fine with a simple turn of a small rod located at each end of the grinder. I like how there are caps at both ends so the "excess" doesn't dirty up the countertops. This grinder would also work with spices as it is very versatile for the fill area. Hubs did point out that one needs to be carefully when turning the grinder because it comes apart if exerting a bit of force. You definitely do not want salt or pepper all over your kitchen. It would be nice if there was some sort of extra click when connecting the two compartments to the center. Ozeri offers various products for your modern home including kitchen and bathroom scales, wine openers and pedometers! Buy It: You can purchase the Ozeri Fresko Duo for $19.95. Make sure to connect with Ozeri on Facebook! 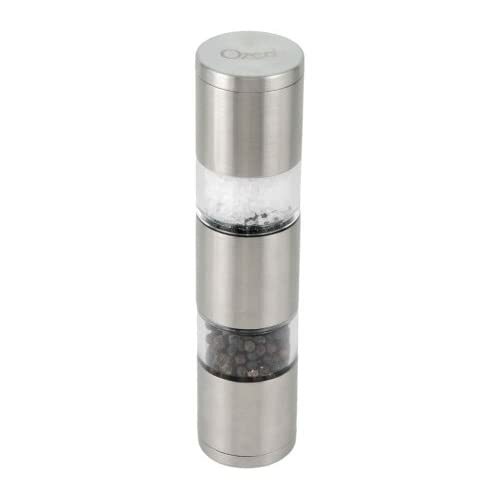 Ozeri Fresko Duo Salt & Pepper Grinder! I love the black tungsten rings! I could really use a kitchen scale too! I would love to have one of their kitchen scales. I would love a kitchen scale and new pans! I love the thermo glassware! I would love to have a light for my Kindle. I would love one of their digital bath scales. I like the thermo glassware. I like the frying pans. I like the kitchen scales! i've been teaching myself to cook and they would be useful. I really like the glass kitchen scale! I would like one of their digital kitchen scales. I'd like the electric wine bottle opener. Their pots and pans look awesome! I also like the Ozeri Precision Pro II Digital Bathroom Scale! I like their bathroom scales! I could use a bathroom scale- theirs are so pretty! a new kitchen scale. thanks! I love their bathroom scales, very nice! I really like the kitchen scales and the ceramic cookware. I like their Thermo Glassware. Kitchen scales to measure flour! I would love to try their ceramic cookware pans...they look fantastic! I love all of their Thermal Glassware! I would love a kitchen scale! I would love one of their bathroom scales. there tungsten rings are nice. Ceramic Skillet or the bathroom scales! I would love one of their bathroom scales! I like the circle glass bathroom scale. I like the pepper grinder that is battery operated. I would love one of their kitchen scales! I'd love to have the thermo glassware! I love the Thermo Glassware products! Another product I love is the bathroom scale. Id love to have one of their thermo glasswares.